Otherworld Encounter as is any art exhibit is subject to interpretation. For us, it was an indoor art crawl that converged into an interactive science fiction adventure. This innovative encounter is happening at the Nashville Fairgrounds in Nashville, Tennessee from December 28 through January 13, 2019. 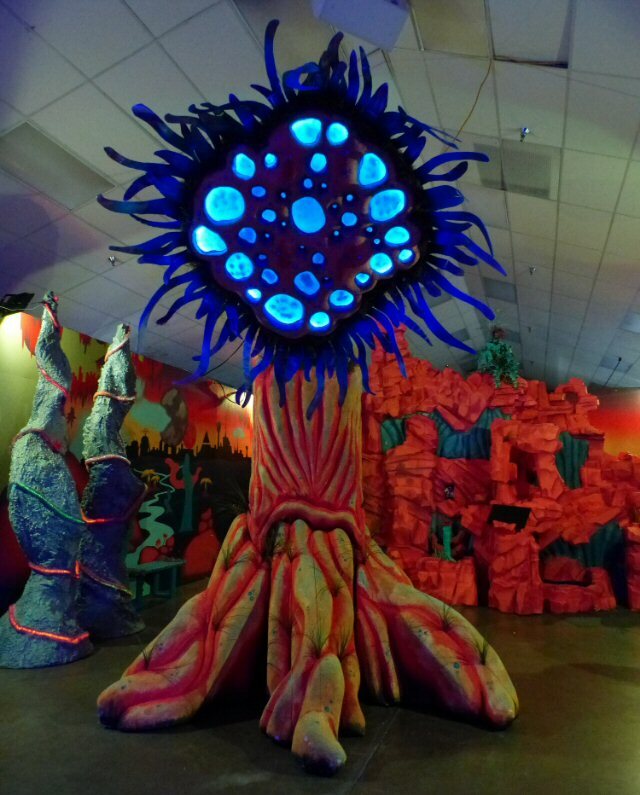 Otherworld Encounter was inspired by Meow Wolf in Santa Fe, NM where immersive art installations are combined with multimedia elements. Otherworld Encounter will be on the move but organizers are hoping to land a permanent location in Music City as sonic and visual arts are the heartbeat of this expanding region. To us, this painting looked like a depiction of a futuristic Nashville? The mission of Otherworld Encounter is “To create a fun and interactive visual art experience, where the general public can SEE, TOUCH, CLIMB, SWING, PLAY, & BE part of the art and creative technologies.” They accomplished this in Nashville with a series of rooms each with their own unique theme where patrons of all ages were encouraged to interact with the installations. Throughout the Encounter spacey music was piped in. The exhibit began at the Dream Machine where we were asked to focus on colors and patterns in the opening video. It was implied that our imaginations would shape what we would see which is true as all of us view art thought our own spectrums. A door opened onto Centralia an alien Central Park concept that had eight activities featuring a light motion sandbox, fountains, slime, swings and more. New buildings aren’t the only thing growing in this town. Another spot gave us the feeling of being under the sea. We walked through a hall of still life paintings yet some of them shifted as we were staring at them. This flowed into a space theme where florescent colored tubes served as musical instruments. Next, the Reverse Reflection room showcased a cauldron of fog and mirrors that created reverse images and this pretty piece of art looked to us like a large amethyst crystal. 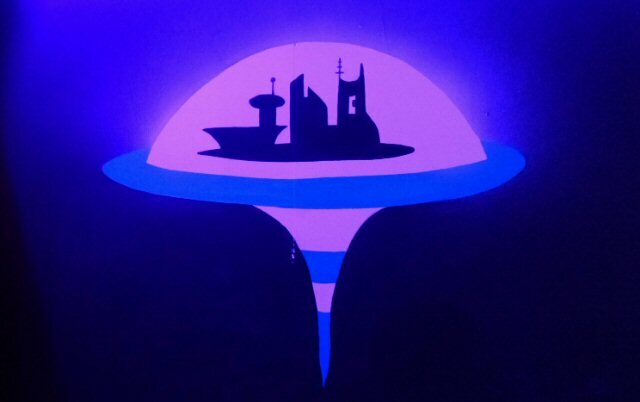 Space Dome was a bigger display that featured a 360′ dome that included an UFO ride through the Otherworld’s galaxy. Throughout the exhibit symbols were featured and they ended up being important as they were needed to open the door to a “secret room”. Once inside we were treated to the history of gaming starting in the 1970’s to the present. 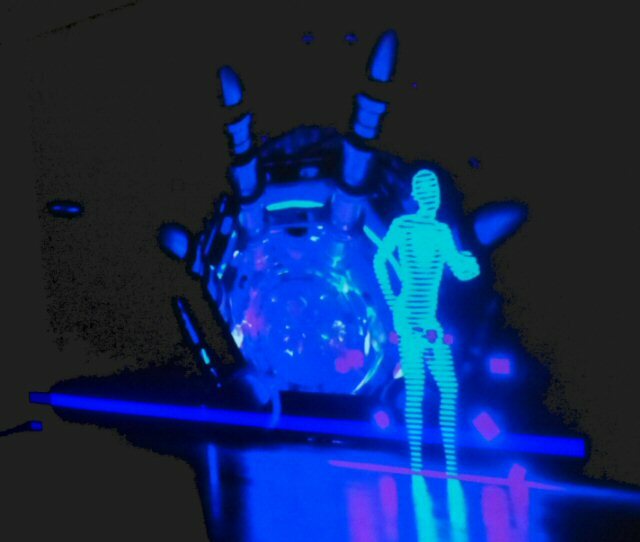 Folks were able to play the games spanning the decades and see in a circular view the evolution of that art form culminating in a virtual reality game that incorporated capturing dreams while floating around as a well-armed person in a futuristic place. 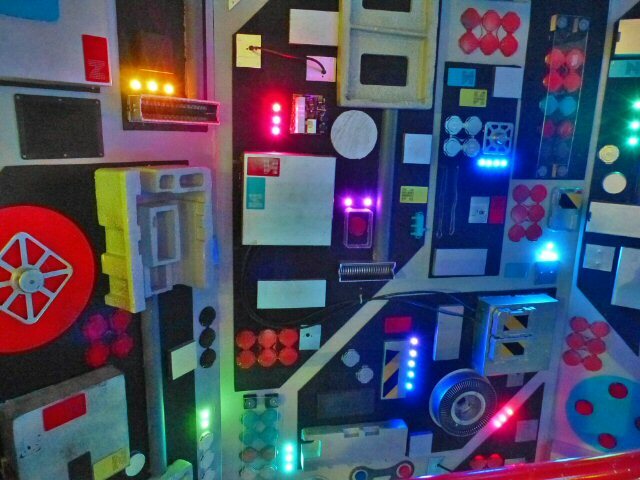 Your control panel to the realms of the otherworld. Otherworld Encounter was the launch of what could become a business and outlet for innovations focusing on engaging encounters that meld art, music, technology and more. Music City is already a creative hub so Otherworld Encounter could be a good fit but for now come on down to the Nashville Fairgrounds to experience Otherworld Encounter where the “arts festival meets a science fiction movie” before it moves beyond Mid-Tenn.
Otherworld Encounter proved that at least someone is thinking about the future in Nashville. Nashville – The Stars Align For Sing!